Framing is really all about creating context, and I enjoyed the parts in Graphic Design that pointed out how often we use those contexts every day without even realizing it. One piece of example work, in fact, was made up entirely of the frames we constantly use on computer screens (pg. 100). The text you’re reading here is framed – at least – by the computer screen, the window you have pulled up with your Internet brower, and the design of this web site. A grid, as described in Thinking with Type, is basically a network of related frames. Any sort of grid divides a given space – which is likely a frame itself – into a network of smaller frames within which a designer will then work. I also enjoyed thinking about the different ways gridding and framing can work. In TT, Lupton discussed how typography can be a frame. “Typography is a form designed to melt away as it yields itself to content” (115). This observation goes back to the most basic principle of design: Good design is invisible. The most effective frame is one that viewers don’t even notice. (Of course, this changes if the frame is actually the subject of a piece — but, in that case, the frame is performaing an additional function besides framing that supersedes framing.) If a non-designer viewer stops to notice a frame when attention should be directed inside the frame, that’s an error. 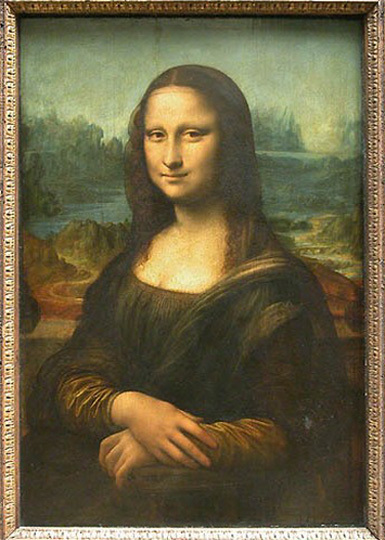 (Have you ever noticed the frame on the Mona Lisa? Didn’t think so.) Framing, then, is the beginning of design. It has to occur first, and the rest of the piece will flow into and around it.